Masks in various fantasy subjects made of plastic. Desingned to dust te top of your desserts with chocholate powder or superfine sugar, or to create relief with the help of a rolling pin on the marzipan layer on the top of your cakes. Also suitable for airbrush coloured decorations. Creative stensil fork mould suitable for marzipan, sugar paste or almond paste. Size 11.61" x 7.87"
Creative stensil knife mould suitable for marzipan, sugar paste or almond paste. Size 11.61" x 7.87"
Creative stensil spoon mould suitable for marzipan, sugar paste or almond paste. Size 11.61" x 7.87"
Set of 10 Mini Masks for Decorate Hot Beverages. Diam 3.74"
Masks in various fantasy subjects made of plastic. 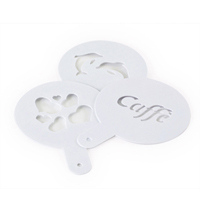 Excellent for the decoration of the top of your hot beverages like cappuccino or hot chocolate.